What Dishwasher Water Softener should you use? Water softeners remove the calcium, magnesium ions, and other minerals that are found in hard water. When these are removed, you will get what you call a “soft water” that is very compatible with soap and extends the life of plumbing. If you aren’t sure of why you should get a water softener for your dishwasher, you will know soon enough in this article. Dishwashers need soft water to wash and rinse dishware; otherwise water stains will be left behind on the dishes and interior racks and walls of the dishwasher. There is a certain measurement on how “hard” water is, which is measured in terms of grains per gallon (GPG) or milligrams per liter (mg/L). If you had your water tested take note that soft water measures only 1 GPG (17.1 mg/L) or less while hard water is around 7-10.5 GPG (120 – 180 mg/L). What are the effects of hard water to your dishwasher? Hard water causes soap scum stuck and dried in the interior or the filter of the dishwasher. Hard water causes limescale buildup in the interior. Not only that, the plumbing connected to the dishwasher is also affected by this buildup. This is because the minerals found in the hard water precipitate inside pipes, which greatly reduces flow and eventually lead to clogging. Hard water reduces the ability of soap to lather, which results to the inability of the dishwasher to thoroughly clean your dishes. There are many ways to soften the water used for your dishwasher. You can filter your house water by distillation or reverse osmosis or adding packaged chemical softeners, or running it through a machine that softens water. The methods you can use vary from dishwasher to dishwasher. What is the best way to soften water for your dishwasher? As previously mentioned, there are several methods you can try to soften the water used by your dishwasher. However, not all can be effective for your dishwasher. The first thing that you must do is measure the hardness of the water to know the appropriate action to take. You may get this information from your local town hall water department if you use public water supply or your private well. If they can’t confirm the level of water hardness from your well, you may take a water sample to a local water-testing lab to test your water hardness. You may also not need to do anything of the above and just spend some time observing how your dishwasher performs. If you see that it’s not cleaning thoroughly, it leaves water stains on your dishware, and leave annoying soapsuds all over the machine, then you’ll immediately know that your water is hard. Boiling the water – Although this isn’t really recommended for dishwashers due to the amount of water needed to be boiled and the fact that it wastes too much gas, you can use this instead for bathing, brushing teeth, etc. Adding ammonia, lye, baking soda, or borax – This works great if you intend to add soap along with it so it is recommended for doing the laundry. This method won’t soften the water, but instead hinder soapsuds from forming. Installing a mechanical water softener – This is the most efficient way especially if you want the entire water supply in your home to be soft. The downside is the cost of operation. Using a specialized water softener – There are water softeners in the form of salts that can be really effective for dishwashers. Key Takeaway: Remember to use the best method or option for you. If you intend to use a water softener only for the dishwasher, consider using salts to pour into the machine. If you want to have soft water all over the house, consider installing a mechanical water softener. How to use salt as water softener for dishwasher? Follow the step-by-step guide below on using salt to soften the water used by your dishwasher. Step 2: Find the location where you will lodge the salts by removing the lower rack of your dishwasher. The location of this container may vary so check your manual to exactly pinpoint it. Remove the lid that covers the salt container by unscrewing it. Step 4: Clear out the excess salt found on the rims of the salt container. You can spoon the salt out if you have put in too much. Replace the salt container lid and tightly screw it. You’ll know when you’ll have to refill the salt, as the sensor will update it on the control screen (if you have it). Key Takeaway: The use of salt for softening the water used by dishwashers is a relatively cheaper option. It is also centralized to the dishwasher so you’re sure that it only uses soft water without you spending too much on other water softeners. There are a lot of options to use for your dishwasher water softener. You can opt for the expensive but hassle-free mechanical water softener or settle for a cheaper water softener salt that must be refilled from time to time. Whichever you choose, it’s great as you’re maximizing the cleaning potential of your dishwasher. How to fix and replace your Dishwasher Overflow Valve? The overflow valve is found in the air gap mounted on your sink next to the faucet. When the dishwasher overflow valve is filled with water that it spurts out of the air gap on your sink, you know that something is wrong with the tubes connecting your dishwasher to the correct outlets. The problem only occurs when you run the dishwasher as the dirty water used to clean the dishes need to go somewhere. You will need to check the air gap and the two hoses connected to its bottom. You can try the method below to troubleshoot your dishwasher overflow valve. What is the step-by-step procedure on fixing and replacing dishwasher overflow valve? Step 1: Turn the water supply valves off before you start doing anything. Removing the hoses may result to the continuous flowing of water. You may also want to turn the electricity to the kitchen circuit breaker off. Step 2: Remove the air gap or the protruding device installed to your sink or countertop next to the sink. You may uninstall it by using adjustable pliers to loosen the slip joint found underneath the sink from where it is installed. Attaches to discharge outlets with 5/8-Inch, 3/4-Inch and 1-Inch connections. Step 4: Trace the connections of both the hoses and remove them from their sources, which is the dishwasher and the garbage disposal. You may want to check the connections carefully to see if there are any obstructions or clogs. Step 5: Take the hoses and fittings outside and use a garden hose with strong pressure to wash down the hoses. Use the pressure to wash down any debris, dirt, or obstructions found in the hoses. Also check underneath the sink if there are big items blocking the path of the hoses. Arrange these items accordingly. Step 6: After all the hoses and fittings are thoroughly cleaned and washed down, reattach the hoses to the proper sources and secure them with slip joints of hose clamps. Return the air gap complete with the cleaned dishwasher overflow valve into the sink where you previously took it. Again, secure it tightly using pliers. Step 7: Turn on the water supply lines and circuit breaker that you turned off prior to the start of the DIY project. Connect the dishwasher to power after you’re sure that everything is secured in the right places and turn it on. Test if water still comes up to the dishwasher overflow valve. Key Takeaway: Finding out what’s wrong with your dishwasher overflow valve is not that difficult. If you have managed to install the air gap yourself, you will know exactly how to disassemble it and find out the root causes by checking the valves, the connections, and the hoses. This step-by-step guide is aimed at troubleshooting and fixing the problem, rather than replacing any part mentioned in the guide. What causes problems in the dishwasher overflow valve? When you encounter problems or overflowing in the dishwasher overflow valve, most likely, the problem lies in the air gap, disposal hose port, or the hose connected to the air gap. Either any of these parts are clogged or it is obstructed by something big and heavy. Food particles are stuck in the hose. Instead of going straight to the bin, food particles may get dislodged into the house because of build up of grim and grease that attracts food to stick. You forgot to remove the plug in the garbage disposal (this is very little minimal error. Ensure to check this before disassembling anything). The garbage disposal bin is full or there is something obstructing it. Once this happens, no water may go to the bin, which causes the waste to go up to the dishwasher overflow valve. Key Takeaway: It is important to immediately fix any problems in the air gap and dishwasher overflow valve because it may cause dirty water coming from the dishwasher to be pushed back into the appliance (also called backflow) and contaminate any dishes or utensils inside. Dirty water should be heading straight to the disposal. Remember, wastewater draining back into the dishwasher is a health hazard. Repairing your dishwasher as soon as it encounters any problems, whether clogs or leaks should be addressed right away. It really doesn’t matter if you are a seasoned handyman or have very little to no idea about fixing things, as long as you understand and know how to follow directions. Problems such as those that involve parts like the dishwasher overflow valve is not that difficult to troubleshoot and fix. What are the best Stainless Steel Dishwashers? Dishwashers are a must in every home, especially for big families and those who always stage home parties, because it takes off the load of having to wash tons of dishes every day. Instead of spending your precious time soaping and scrubbing in the sink, it is better spent bonding with the family or doing more pressing chores. Many American families have made the dishwasher a staple in their kitchens, with the same necessity and need for other major appliances such as vacuums and ovens. This is because dishwashers save you time and energy at the price of a little bit of electric consumption cost. Because of the large demand for dishwashers, many companies constantly release different models, all featuring the newest technology involving wash cycles, other energy saving options, and durable stainless steel bodies. The wide array of choices makes it difficult for a consumer to pick the right one for him. To help you with deciding and to give you an idea of what dishwashers are out there, we have reviewed three best-rated stainless steel dishwashers below. What are the best-rated stainless steel dishwashers? This dishwasher, with 4.3 out of 5 stars rating on Amazon, is one of the best-selling in its category not only because of its smooth stainless steel finish, but also because of its great functionality. Features: This is a built-in dishwasher that you can integrate into the existing cabinetry of your kitchen, great if you want a smooth polished look. It has the standard 24-inch wide size so you can simply push it in between two cabinets, removing the hassle of installation and cabinet customization. PROS: This dishwasher comes with four wash levels and five wash cycles. It is also fairly quiet at 44 decibels sound rating. You really won’t notice its operation once it begun its work. Because it is very quiet, you might be even unsure if it has finished washing. The good thing is that it comes with a red indicator light that flashes while operational. CONS: Only concern of some of the customers is the inability of the dishwasher to fully dry the items it washed using its heating element. Also, the racking system didn’t satisfy a few customers. Just like the Bosch dishwasher, this comes in standard 24-inch size that can be built into your cabinetry with ease. It has this smooth seamless look that makes it appear as if the dishwasher is built-in instead of pushed in. It has three wash levels and six different wash cycles. Features: The GE dishwasher is very quiet, having 42 decibels sound rating. It also comes with a hard food disposer to ensure that there will be no clogs along the way. The full stainless steel interior is also great as it easily resists corrosion and rusts, even without having to try the insides after every wash without using the heat dryer. PROS: GE engineered their dishwashing system to have 102 cleaning jets to achieve ultimate washing. It comes with different washing cycles where you can choose to achieve the best clean. The racks are very versatile so you can put in a lot of stuff and it will still clean everything properly. CONS: Only con for this dishwasher is the price; it is quite hefty for a dishwasher of this size and built. There are other stainless steel dishwashers that are a bit cheaper and will function as advertised. This dishwasher, rated 4.2 out of 5 stars, is one of the go-to of many consumers because of its affordability and relatively small body that can still fit a lot of items for washing. 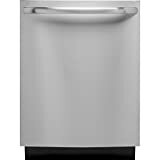 Features: This is an 18-inch built-in dishwasher that is slightly narrower than the other brands mentioned above. This is good for smaller and more compact kitchens because it won’t take up too much space, while still being able to cater to a lot of items. PROS: It has an energy saver dry option, great if you don’t need to use the dishwasher to dry your items and air-dry it instead. This will save you electric charges in the long run. It has stainless steel interior that is durable and efficient. It also comes with a delay start option that lets you run the dishwasher on your schedule. CONS: Those who have bigger families that have more dishes to wash may not find the interior of this dishwasher sufficient. Make sure to personally check the size to know if it suits you. Key Takeaway: The reviews listed above for the three products are only snippets and you may find more information when you check the product itself. Make sure to know everything about the dishwasher before proceeding to purchase it. This is so that no buyer’s remorse or regrets would be felt. Why should you get a stainless steel dishwasher? It is very durable and strong; it won’t be easily dented even by accidental bumps of large pots and pans. It is very low maintenance. You don’t have to worry about rusting or corrosion. It employs lower watts for heating element when it comes to drying, saving you bucks. It is more efficient during heating because the metal reflects the heat better. It allows for higher water temperatures so you’re sure that it truly sterilizes dishes. Whichever model you pick, make sure to spend your hard-earned dollars on something that you think will be worth it. Read reviews, comments, and feedbacks left by customers to the products that you are eyeing so you’ll have an insight and are prepared on what to expect. Customers mostly give very detailed and honest reviews so you can count on them.